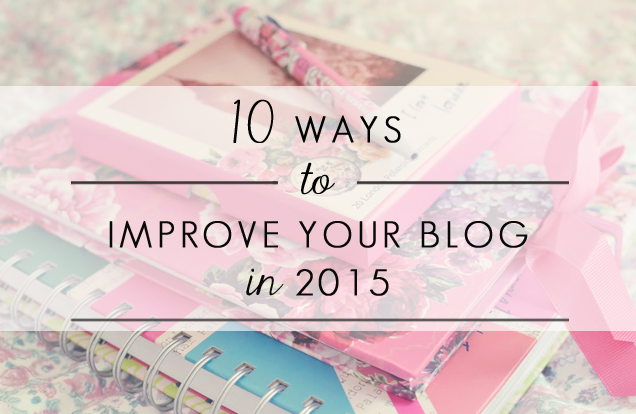 I started thinking of ways in which I could improve my blog in 2015 or even just be more happier with it. I jotted down a list of things and have narrowed it down to ten "blog resolutions" realistic ones (I wouldn't want to set myself up for a fail, especially if there are ten resolutions in total!). They're not technical tips but rather personal advice in which I would give myself in order to improve my own blog.We shall come back to this in 12 months time and see how I've done! Not to say that I won't be checking but I can't let numbers rule my brain anymore than it has done. 2014 became the year that I obsessed with stats, constantly checking how well (or not well, as the case may often be) my blog was doing on a day to day basis. We're talking google analytics, unique hits, pageviews, bounce rates, social media followers, social media interactions, bloglovin', GFC, and all the other numbers that bogged me down. Each day I wanted to beat the last. I got so obsessed that I even downloaded a real time traffic counter app on to my phone that showed how many people were on the site at any given time. This was when it got out of hand and I knew I had to get rid of the app and stop worrying it. I'm going to try and check Google Analytics 2-3 a month instead of daily, and I reckon I'll be so much happier with my blog! I know I've already failed on this so far (oops!)... but I blogged more than ever in 2014 and I do feel like I could do way better! During the first half of the year, I found myself "stuck" on what to blog about but I got in to the swing of things over the last six months. I know that I can keep it up and do a lot better. I'm a bit scared of this resolution as it could turn around and bite me in the bum! But if I happen to be having writer's block, I won't force it. I will promise myself to step away from the laptop and come back when my brains is feeling refreshed and rebooted. Aiming to publish more blogpost will probably mean you'll see a wider variety of content on my blog, and I hope that that's ok with you guys. I want to write more blogpost that will help people with their own blogs. I felt that last year was the year that blogger came out of our little bubble and actually tried to help others. I always thought, in general, that bloggers were a bit cagey and secretive about the way the run their blogs. And I totally understand where they're coming from because in the very beginning, I was the same too! Now it seems that the tide has turned, and as a community, we're a lot more open to offering advice and I personally have no qualms about giving advice or answering any questions readers and fellow bloggers may have. If you want to know what camera or lens I use, I'll tell you. If you want to know how I did something on my blog, I'll tell you. If you ask tweet me or email me asking for blog advice, I'll give you a straight-up answer and do my very best to help you. Let me know what types of posts you'd like to see on this blog! I don't mean this in a "Don't be fooled by the rocks that I got, I'm still, I'm still, Jenny from the block" kind of way. I mean your blog roots and going back to where you started and for me, that was fashion and personal style posts. Last year, I felt that I couldn't go back to how I started with taking outfit photos in the back garden or in my little bedroom behind a white wall. I put too much pressure on myself to go out and get the most fabulous photographs (As pretty as those photos look on a blog, it can sometimes feel intimidating and not very relatable.) It's natural for anyone to evolve but I shouldn't give myself a hard time if I want to go back to square one from time to time. I'm good at meeting deadlines for work and clients but I need to improve the organisation of my blogposts. I have never been that good at scheduling blogposts in advanced but during the lead up to Christmas, I was working two weeks ahead and it felt good! This is something I need to keep up! Good quality imagery is important to any blog or website. I work really hard on the visual side of this blog, it takes me ages to get the photos right but I think it's because I overthink it (and that's only because I want my photos to look perfect). I don't always get it right but I'll continue to maintain the standard of photography. There's always room for improvement, for sure! Especially in the lifestyle/outdoors scenic area, I need a lot of practise. It's awesome that I get to work with brands but I've got so much to say on this topic, I may save it for another day! On the whole, I enjoy this side of blogging more so with beauty brands than the fashion ones but I have got to know some really nice people on a personal level! Most agencies and companies I've worked with understand the brand-blog-relationship for which I am grateful for, it makes things so much easier. Without losing integrity (because I remain very selective with what I accept and I always said no if a campaign wasn't right or if they tried to take advantage) I did a lot of "back-scratching" with big fashion brands in the first half of 2014 in hope that I would strike up a good working relationship with them but it left me feeling disappointed because once I did the outfit post for them, I heard very little back and this made me feel used. It didn't make me feel good and I was left wondering what I had done wrong. There's a hell of a lot of I'll-scratch-your-back-and-you-scratch-mine in the fashion industry but this doesn't work for me so much so I've learnt to negotiate a mutually beneficial outcome and gain control of my blog. I must remember to do what makes me happy and not what pleases them. I love social media but for a long time now, I feel that there's SO much emphasis on strategy. I just want it to be like how it was before: strategy-free fun! If you don't have social media for your blog, then make sure you sign up to the major platforms and learn how to use each one. I know it's extra work for what is essentially a hobby but the outcome can be rewarding. One thing I want to do is suss out how to use Facebook page effectively. I worked hard on it throughout the years to build it in to what it is but now it's a bit of a lost cause! It used to be so simple to use but with a lot of new algorithm changes, not everyone who is following your page gets to see your content (unless you pay for an ad or pay to boost a post - but I've never had much luck with that!) and it makes me want to deactivate it! I won't give up just yet!! There was a time when I was anti-giveaway on my blog and it took me a while to get around the idea. I have never contact a company and ask to host a giveaway, but when a brand approaches me, the ball is in my court and I will try ask for the best for my readers and blog followers. You may have noticed that since the Summer, I've had a good roll with giveaways. We've given away several NIVEA goody bags filled with the latest beauty releases, a Gigaset tablet, cloud9 hair straighteners, Alex Monroe bumble bee necklace, skincare worth £300, a £500 Hobbs gift card - just to name a few. When prizes are as good as that, how can I say no? I think you guys deserve it! I'm not going to inundate the blog with giveaways but once a month (if the prize is amazing) is a nice way to give back to readers, just like how the magazines do it. This is a tough one for everyone but comparison really is a thief of joy. At some point in 2014, I hit a million pageviews but I didn't mention it to anyone, I didn't say a thing. I just did a little jump for joy and then remembered that other blogs reached their first million view ages ago and convinced myself reaching the milestone wasn't a big deal, that it wasn't enough to get excited about. This is what happens with each milestone I reach and that's kind of sad, right?! This also proves my first point about being obsessed with numbers and stats. It's not all that important and t doesn't even matter at the end of the day if when I check my stats, I can't even be happy with what I see. Even though we're always striving for more, we should slow down and be proud of our own achievements. I WILL be happier with myself and my blog when I learn to stop comparing myself to other people.